Autographed Stolen Time Poster (11x17) - NEW! Give it as a gift or keep it for yourself. This small (11x17) poster is suitable for framing. Personally autographed by Michael Stanley. Give it as a gift or keep it for yourself. This (24x18) poster is suitable for framing. Personally autographed by Paul Christensen. Give it as a gift or keep it for yourself. This (24x18) poster is suitable for framing. 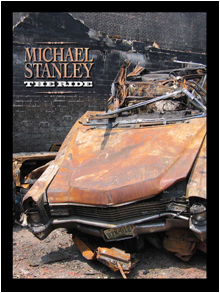 Personally autographed by Michael Stanley. Give it as a gift or keep it for yourself. This (11x14) poster is suitable for framing. Personally autographed by Bob Pelander. Give it as a gift or keep it for yourself. This (24 x 18) poster is suitable for framing. Personally autographed by Michael Stanley. Give it as a gift or keep it for yourself. This (18 x 24) poster is suitable for framing. Personally autographed by Michael Stanley. The striking photo was taken by Michael on a trip to Ireland.